An electrical bicycle, or an ebike, is like an ordinary bike with an electrical motor. With an ebike you get all the benefits of riding a bicycle but with added versatility. The motor powers the bike, extending your range and boosts your capabilities. An ebike is an easy mode of transportation for work or for recreational activity. The motor will give the bike extra power depending on the assist level selected. It is different from an electric moped or scooter since the rider has the ability to control the intensity of the pedalling by selecting the level of assist. EbikeBC has a large inventory of ebikes for any type of rider enthusiast. From ultra-light folding ebikes to high performance mountain ebikes, our products are well engineered, reliable and durable which will give you fun and convenience for years to come. Throttle function as power on demand mode is available on some versions. “RIDE CLEAN”, “GET LEAN”, and “GO GREEN” with EbikeBC. Whether you want to use your ebike for pleasure, sports, mountain biking or your daily commutes, we have a variety of ebike models to fit your needs. To know more about each ebike you need to click the particular model and read details. 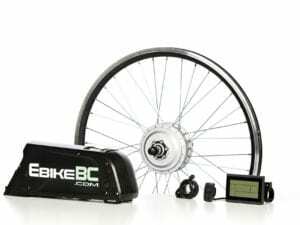 An ebike kit is a standardized set of components such as electric motor, controllers, sensors, cables, battery, charger and some accessories to be installed on a regular bicycle to convert it to an e-bike. There are millions of bicycles with hundreds of styles. If you don’t use your old bike why not convert it to an ebike to give it more versatility? 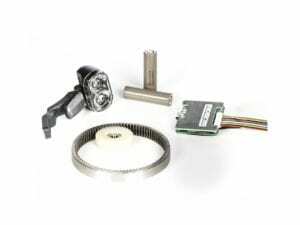 They are very affordable and with our converter kit easy to make motorized. 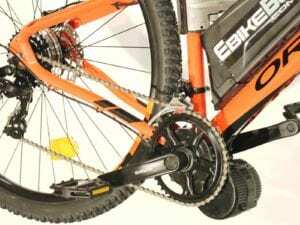 To learn more about EbikeBC geared hub motor kits watch related videos. Higher electric power can be achieved through higher RPMs with a smaller size and lighter weight electric motor. An embedded high-efficiency, reliable, maintenance-free Nylon sun-planetary gear system provides greater torque and power in a very small and lightweight hub motor. People rarely recognize this is a hub motor as it is a little bigger than a conventional bicycle hub or brake hub. An automatic clutch keeps the wheel released while freewheeling and engage it only when you need a torque or power from the motor. No noise and no sense of geared motor engaged in whole trip. Installation simplicity, light and small size, low moment of inertia, high torque and power are achieved accompanied with maintenance free reliability in hub geared motor. 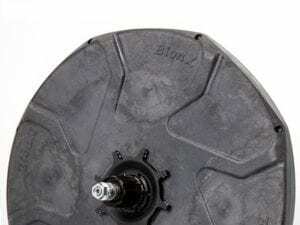 BionX hub motor is the best engineered direct (Gear-less) hub motor in the world. Adding only a little weight to your bicycle, the BionX system works seamlessly as you pedal. The control processor continuously analyzes your torque input using strain gauge sensor on the axle of the rear wheel and feeds that information to the motor, which applies electric assist in proportion to how hard you are pedaling. The best choice is to have the mass of the motor attached to the bike’s frame for higher wheel maneuverability, especially for mountain biking and full-suspension bikes. These motors are typically more complex and heavier due to the required mechanisms that separate the pedal crank from the chain ring. This is necessary to let pedals and motor drive the rear wheel through the bike’s chain independently. Bosch, Yamaha, Shimano, Brose are well-known brands offering this type of motor, however they only produce motors for OEM e-bike fabrication. They all need a special frame design to fit this motor. Bafang or 8FUN is a well-known factory which manufactures mid-drive motors for regular bikes retrofits. They require standard bottom brackets to be fit on. Transmitting the muscle power and motor power through the existing chain and cogs is problematic for bicycle conversion which reduces the reliability and durability, hence it is not recommended for urban or commuter bicycle conversion. The Li-ion battery is the most critical part of the ebike technology for cost, performance, and safety concerns. We don’t use cheap or low-quality batteries. With all of our products, we use A-grade branded Li-Ion cells including Samsung, LG or Panasonic. Li-Ion batteries have both cyclic and calendar life. For that reason, we produce and import batteries at least four times a year to guarantee delivery of the best and newest batteries to our customers. A Li-Mn battery is lightweight with 500-800 full cycles of effective life and is the best choice for an ebike application. Packs of 30, 40, 50 or more cylindrical 18650 cells are the best option because you have the ability to maintain them compared to polymer packs. They are also lighter than Li-FePO4 technology. Each 3.7V cell is continuously monitored and protected from over-voltage, under-voltage and over-current as well as 10 or 13 series cells voltage balance to guarantee maximum pack life cycle. The battery packs are manufactured under strict qualifications and are CE and RoHS stamped. In addition to the motor and batteries, all e-bikes and conversion kits have some electronic modules to drive and control the toque, speed, and power of the motor. These modules also ensure the proper motor working condition of the motor which is typically brushless DC motors. There is an interface display to switch on-off, set the level of assist and see the charge status of the battery. Usually the logics and programs are loaded to this part which can be called computer/interface of the e-bike. In most systems, you can set or change some basic settings, see the speed, mileage, power, voltage and a lot more as well as error codes in case of a failure. A thumb throttle which gives you extra power is best and exists in most of our products which activate the motor proportionally to the twist no matter you pedal or not to give you a fully electric ride in case you cannot pedal or need an instant acceleration or uphill push. Switches called brake cut-off sensors are provide to cut off the power whenever the brake levers are squeezed. It is a double safety feature for panic stops and not a mandatory device. This switch can call regenerative mode of the controller if equipped. To learn more about each individual specs select the product and see details. 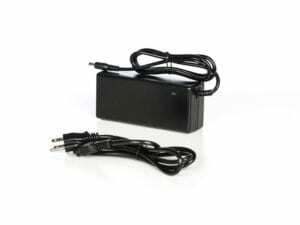 Battery chargers are smart CC-CV and will automatically disconnect after battery is fully charged; you can leave them plugged overnight with confidence. Chargers are UL (C & US) Listed and stamped. What does the regulation say about using electric bikes? e-bikes are limited to 500 W output (in some areas it varies 750W and 1000W), and cannot travel faster than 32 km/h (20 mph) on motor power alone on level ground. Generally, they are considered vehicles (like motorcycles and pedal cycles), so are subject to the same rules of the road as regular bicycles. The electric motor must be 500 watts or less and be capable of propelling the cycle no faster than 32 km/h on level ground without pedalling. The motor cannot be gas-powered. The vehicle must meet any other conditions in the Motor Assisted Cycle Regulation (B.C. Reg 151/2002). Search for your local e-bike regulations. Our offered e-bikes and conversion kits can be set and customized based on various regulation constraints and it is the customer’s responsibility to maintain it street legal for the area they are using. Vehicle licenses and liability insurance are not required in US and Canada for street legal ebikes and conversion kits we offer. We have ebikes capable of 57km/h, however the controller will cut-off the assist power beyond 32km/h by law. Basically 350W systems gives the maximum street legal performance on ebikes; however 500W gives a better performance on hills yet street legal with the max speed setting at 32km/h. Who do use electric bikes? Electric assist bicycle concept is to enhance range and performance of regular bikes without destroying the spirit of conventional human powered clean and healthy bicycles. You will feel more confident to commute with the assisted system, yet doing aerobic exercise riding faster, further and more often. Basically our ebikes have the potential to be used as a fully powered vehicle where you cannot or don’t want to pedal due to health condition; however full benefits of electric bikes show up when using on pedal assist mode. What are the running costs of electric bikes? Our motor/controller system is maintenance free. The batteries have about 80$/Year depreciation on average. The average power consumption is about 1KWh/100km, taking 1KWh 10cents then the power cost of 100km will be about 10 cents! The range depends on many factors such as weight, road condition, bicycle, weather, level of assist and amount of muscle power being used. In general we maintain a minimum 30km average range on our systems. The minimum compatible battery capacity is capable of over 100km range if being used on level 1 of assist. You will be guided through the right battery capacity for your particular case if you inquire. How long does the battery last before it needs to be replaced? We offer Li-Ion battery packs which are well engineered and protected with BMS (Battery Management System) for longest possible life. The cells used in our battery packs are A-grade LG, Samsung or Panasonic branded cells which have strict quality control and maintain their quality and performance for long. The technology and quality of cells are similar to what Tesla is using in their cars. There is a calendar life as well as cyclic life on the battery cells which is about 6 years and 800 full charge/discharge cycles. If using daily, you can expect about 20000-30000Km before the battery capacity shrinks to less than 50% which we consider as dead. How costly is a replacement battery? The Li-Ion battery is quite costly. The number of cells in a typical ebike battery is 40-50 units; almost 10 times more than a laptop or 50 times of an Iphone with similar quality and specs. Battery is almost half of the cost of a conversion kit or 1/3 of an average complete electric bike. What maintenance is required for electric bikes? Usually there is no scheduled maintenance requirement for e-bikes other than simple physical protections and keeping batteries fully charged after each use. Does the electric bike recharge by pedaling? Is the hardware available to recharge the ebike by pedaling? Yes. Is it possible to recharge by pedaling? No; and the reason is regeneration demands heavy push to pedal which is exhausting. Regeneration only makes sense when you use the kinetic energy of a bike in breaking or descending a downhill which at best it can increase the range by 10%. The idea of regenerative braking doesn’t work well on bikes because unlike cars the mass/aerodynamic loss ratio is too small. It takes about 4-7 hours depending on the battery capacity using standard chargers. We may offer quick chargers which doubles the speed of charge. Not at all! Un-like traditional Nickel based batteries Li-Ion battery has no historic effect on charge and toping up the battery after each use gives a better life condition. 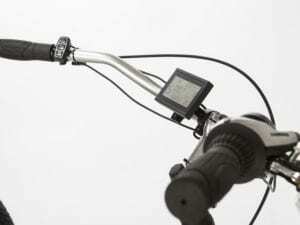 Will your e-bikes run without pedaling by use of throttle? For most of versions yes, please check products specification. Can I put my eBike on a car rack? Yes, Our products typically add 6-7Kg (13-16 lbs) to the weight of bike. Also you have the option to remove the battery elimination 3-4kg of the weight when putting your electric bike on a car rack. Can I use the ebike in rain and in winter? The system is rain proof, good to go in rain or snow, however no water jet and no parking or storing un-covered in rain or snow. When the battery is empty is it hard to ride the bike? When the battery is dead you will have a regular bike only having 5 to 7 kg more cargo with you. There is no drag or friction by EbikeBC geared hub motor system. How do I decide about buying an electric bike or getting a conversion kit? Buy the electric bike if you have found the right fit with a reasonable price. Do you already have a sound bicycle which ergonomically fits and you like it? Or you want to save on price of the bicycle as well as freeing some storage space? Inquire your conversion kit do it yourself or let a bike mechanic does it. 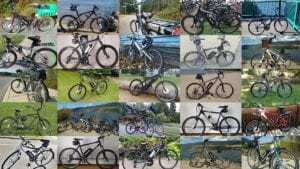 Why sticking to 350W to 500W once others offer 1000W, 3000W or 6000W electric bike systems? Besides by-law limitations for street legal maximum 500W power, There are many engineering and safety reasons behind sizing a motor power on a bicycle, no matter if this is a factory made bicycle or a retrofit conversion project. 3000W, 1500W, 1000W, 750W motors are not street legal and are too powerful and heavy for bicycles. Typically we offer such high power motor system for students or R&D projects, not electric bicycle applications. Putting a 4L engine on a Toyota Yaris is just waist the money and resources. This engine will break the transmission shortly and the small heavy car does not provide a satisfactory drivability on small wheelbase and small tires. 250-500W is the optimum power you can expect a reasonable weight, speed, range, durability and safety on a bicycle. Knowing that an aerobic pedaling power by a regular cyclist is between 70W to 200W helps us understand 500W is like 5 people pedaling power. You may read or see exciting reports or videos about 1000W to 6000W electric bikes, however this will not last long on those bikes. Trust us saying the biggest motor is not the best! Powerful motors are not necessarily more expensive but the voltage and capacity of the battery should be much higher to feed the motor. This increases the cost of higher power systems. What do parameters like Torque (Nm), Power W (Watt), V(Volt), Ah (Ampere-Hour), Wh (Watt-Hour), mean and how do they affect the performance of electric bikes? Motor Torque is the characteristic which reflects the traction (thrust) and is important for climbing up hills. The more torque at the wheel gives you a higher grade-ability. The traction force equals Torque divided by wheel radius (F=T/R). The smaller wheel diameter gives a higher traction force or climb-ability with same motor torque. The amount in Watts shows the power (P) of motor. The power is important for riding faster both on flat or slope. There is a rated power definition for electric motor which is the nominal power the motor is designed to work at which delivers a good efficiency and long life. Usually maximum or peak power is higher than the rated power. For example EbikeBC 350W geared hub motor can deliver up to 500W power at standard controller setting. Voltage has no mechanical effect on the ebike performance. This is a parameter which is set based on electrical characteristics of the motor/controller and wiring. Voltage in Li-Ion batteries is a matter of number of cells in series. Power equals Voltage by Current, the higher the voltage the lower current is necessary to get the same amount of power (P=VI). The voltage should be managed by compromising safety and current rating of component. Having a higher motor or battery Voltage does not translate a higher performance or higher range by itself. Voltage alone doesn’t show any performance characteristics of the ebike unless you know the current rating for motor /controller or capacity of the battery in Ah. Battery Voltage will not be constant and varies based on SOC (state of charge) a complete charged battery voltage is about 42V when it is nominally 36V and battery voltage is about 30V when the battery is considered complete depleted. It’s the current capacity of battery. The maximum current the battery can be discharged at continuously for 1 hour. For example; you can draw 10A continuously from a 10Ah battery for 1 hour or 5A for 2 hours. This is a parameter that gives you a range. However, the energy density of a battery should be measured by Wh(watt-hour) if you are comparing battery systems of different voltage. Ah increase when using higher capacity Li-Ion cells or using more Li-Ion cells in parallel in a battery pack. It’s the energy capacity of battery. Wh=Ah x V. For example a 48V, 8.8Ah battery gives you 48V 8.8Ah = 422.4Wh energy which ideally means you can draw 422W power for 1 hour. The equivalent battery in 36V standard will be about 11.7Ah. What is the difference between 24V, 36V, 48V or 72V? How does it affect performance? A: Voltage has no mechanical effect on the ebike performance. This is a parameter which is set based on electrical characteristics of the motor/controller and wiring. Voltage in Li-Ion batteries is a matter of number of cells in series. Increasing voltage helps maintain a lower current on same power rating which makes it easier to maintain the electrical efficiency; on the other hand lower voltage offers more safety. We have standardized 36V for our street legal conversion kits. Our regular ebike battery packing and wiring is capable of 22A continuous power which is equal to 800W at 36V average voltage. There is no considerable voltage drop for up to 800W peak power with our LG 10.4Ah (minimum recommended for our 500W system is 10.4Ah). The peak current is 25A and the peak power 900W and the voltage drop is less than 3V in our system (all wiring resistance included). There is no advantage in 48V or 52V over 36V for up to 500W rated motor class. There are also some safety concerns for above 42V electric products including battery chargers in some provinces. We have 48V or 72V battery and hub motors for off street use up to 5000W rated power. Is it safe to install motor on alloy or steel front forks? A: The bike fork is designed for severe working conditions including road shocks and hard braking no matter if it is alloy or steel. The amount of stress from motor axle torque is negligible compared to other loading scenarios. However, that’s your responsibility to inspect the fork and headset for any crack or defect to prevent risk of failure. Is it necessary to modify the fork drop out? A: QR dropouts are usually 9 to 10mm considering the paint coat and filing 0.25mm or 0.5mm either sides is sometimes necessary and OK.
Isn’t it dangerous to have the motor on Front fork or one should go with Rear? What is a safe fork for hub motors? 1- Forcing the axle into the drop out and causing pre stress. 2- Inappropriate order or direction of washers or locking washers. 3- Insufficient bolts torque or not providing a proper nut seat on grooved alloy dropouts. The horror is always there if you have an un-inspected front fork and the drop-out fails to hold the axle. No matter if that is a motorized wheel or not. Let’s clarify this first; We have both rear and front so there is no bios. We have had a single front fork failure once and the reason was the locking washers had been placed upside down pushing the axle away from the bottom of the drop out and creating a high stress which caused the failure. Hammer hitting the axle inside the fork drop outs can be another typical mistake people do instead of filing the drop out to remove paint to 10mm opening. Yet, we don’t recommend motor installation on Carbon fiber forks no matter rear or front. Is it necessary to use torque arms for front or rear hub motors on forks? The motor back torque is maintained by the axle nuts friction torque to the fork, not the drop out teeth. Our calculations regarding axle nut friction torque proves that even torque arms are not necessary and useless if the fork is properly inspected for any structural defect, washers are placed as recommended and nuts are torqued properly. Does your hub motor fit thru-axle forks? A: We do not have a hub motor which can be installed on thru-axle forks at present. We are hoping to develop such motor in near future. What are the Cons and pros of front hub motor to a rear hub motor? A: We have rear options as well as front, but 95% of customers choose front and that is because of easy installation and maintenance. Our 350w and 500W geared hub motors are only 2.7kg and 3.3kg. There is no gyro effect on the handling; unlike direct hub motors which are bigger and heavier. So why not selecting the easy to install and prevent transmission adjustment headaches? Front hub motors are performing better on slippery road like snow. If you don’t have any specific reason, don’t go for the rear hub neither a generativemid-drive motor. It may take some time to put spacers and adjust the axle spacing and derailleur adjustment and needs more patience from the bike mechanic if using a rear hub motor. 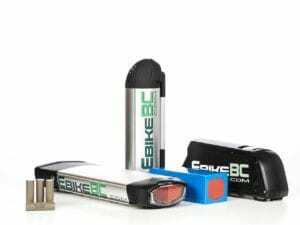 How noisy is EbikeBC geared motor kit -motor? How do you compare the noise with BionX? A: Generally when ebike motors are in use, there is a slight noise which is partially a matter of controller switching, partially from magnets cogging and partially from the gears. 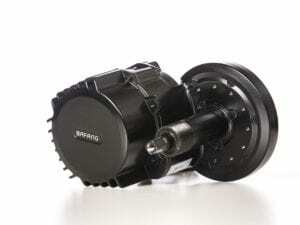 Our controllers are “sign wave” to minimize the electric switching noise, the geared hub motors have a higher rotational speed so the cogging noise is less noticeable and the gears are Nylon with 20% increased width from the original design to eliminate the gears wear and backlash. The motor noise varies by the load and speed, however it is not noticeable compared to the noise of a mountain bike 2.1in thick tire on the pavement. BionX as the best engineered known direct hub motor is a little more silent at working condition. 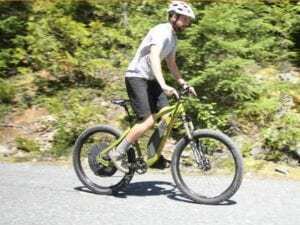 How does EbikeBC geared motor perform when un-powered and using as regular bike? 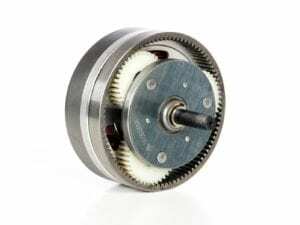 Our geared motors have an internal clutch which is automatically released when motor is not in use. Therefore unlike Bionx which has a slight cogging torque and noise, there is no drag or noise at all when freewheeling. Do we have to install the brake cut-off sensors? These sensors are for cutting off the power in case a panic stop happens. Stop pedaling in pedal assist system may not be as quick as squeezing brake levers. In regular brakes you may need to have this double safety feature. Hydraulic brakes are typically powerful enough to stop you if a panic happens. It is not a mandatory by regulations and you can try your ebike without installing the cut-off and decide if you need it to be installed. After 5 hours charge, the LCD display is still showing half battery. Is something wrong with battery or charger? A: The display charge indicator has a lagging system to be stable against voltage fluctuations. Switch the bike ON, ride it for 10-15 sec and the bars will show full. The best way to see the accurate charge level of the battery is to page the screen by clicking the power button twice; the battery Voltage shows up down the screen. At no load condition ~42V is fully charged ~32V is fully discharged. You can estimate the charge level almost linearly in between. For example, 37V is half way. Can I use the e-bike at freezing temperature like -30C? A: In freezing condition you need to keep the battery indoors. The battery performance will drop down if the cells temperature reaches below 5 degrees Celsius. It warms up if being in use, however in -30C you need to cover the battery to keep it warm. Cold doesn’t harm the battery but just like smartphones loses charge quickly. What is primary difference with D, or L or T for my bike application? A: D, L, T, R, B, P are coding for battery shape only, so the difference is what you see in the pictures for the battery style and place to mount it. Down tube battery dimension matters to make sure it fit inside the frame triangle. I do have a rack already mounted, would the R35 or R50 satisfy? A: Rack battery in R series can be mounted to your existing rack, however you need to drill some holes or make some support for that. Would the rear hub motor compliment with the R35 kit? A: All batteries can technically be substituted for all motors as long as they are all same voltage and the capacity meets the motor power demand. So the answer is yes. Can I convert my front brakes to disc, mechanical or hydraulic? A: The hub is Disk compatible but you need to check the front fork to see if there is a support for disk brake calipers. 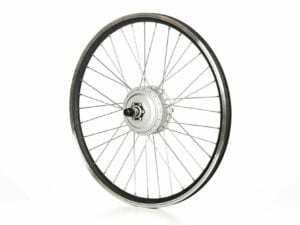 What tire size does the rim coming with hub motor take? The rim we use is an oval section black double walled alloy rim, stronger than regular rims using 2.6mm chrome spokes. The rim has pad brake tracks and the wheel supports both rim and disk brake. What brand of motor do you use in the Hub motor kit? A: 500W Hub motors are a customized version of MXUS XF15. 350W hub motors are an upgraded version of MXUS XF07. The motors and controllers have been redesigned and enhanced for North American standards and usage. What would you suggest for the control system? LED or LCD? A: LED shows the charge level, On-Off and Level of assist selection. LCD has lots of features and settings including speed, distance, time, ODO, charge, level of assist, battery Voltage, real time power, ambient temperature, security pass word, cruise control, back lighted, head light control, power limit setting, speed limit setting and many more. One important advantage of the LCD version is that the system has a diagnostic feature which shows the error code in case of a failure. That makes it much easier for you and us to resolve the technical problems while installation or operation. How does the Hub motor versus mid drive work when not using the boost? A: The mid drive motor (crank motor) is providing a boost to the crank torque, the power is transmitted by the chain to the rear freewheel. The bike transmission gear ratio affects the torque and speed. Also the freewheel sprocket lets the wheel freely roll with no drag. The geared hub motor has a clutch inside which engages the motor when motorized and free wheels when motor is not providing a torque. The brushless geared hub motor does not have any drag when riding as a normal bike; it feels just like 2 free ball bearing. What is the difference between 350W vs 500W? 350W provides 60Nm and 500W peak power enough toques and power for your 10% uphill climbing in pedal assist mode for an 80Kg rider. Don’t expect an ebike climbing up hills fast without pedaling. 500W provides 80Nm enough to climb 15% grade for 80kg rider and power up to 750W. You will have more performance using 500W. Select 500W if you need more climbing ability, higher acceleration, and speed; note that more is not always better since it drains the battery more quickly and is slightly heavier. Typical hub motors are designed for regular QR forks, needs 10mm drop out width, 100mm axle spacing front or 135mm axle spacing rear. FAT bikes need our special FAT hub motors 135mm front and 165mm rear. There is an adjustable tolerance for all forks spacing. Filing 9mm drop outs sometimes required. See hub motor dimensions here. Thru axle forks require different solutions. Contact us for details. Basically all generic BLDC motor controllers should match one another; however there is no protocol for wiring and connections. One should figure out the wiring pin by pin if a wiring diagram is not available. There is always a way to put the broken motor or controller back to work; we should work out the lowest cost with better result. We will have various solutions for older ebikes battery replacement; either by installation of cased battery packs or refurbishing the existing battery case. 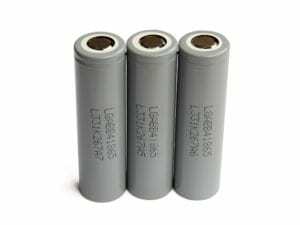 You need to send us the existing battery and charger so that we test and refurbish with a similar or better capacity and performance using 18650 Li-Ion Cells from LG or Panasonic. All the battery packs are protected by BMS for over current, under voltage, charging over voltage, cells voltage balance to ensure the safety and durability of the battery pack. 80Nm or 60Nm is measured based on 26 x 2 tire by measuring the stall traction force of the wheel on 0 speed full throttle. 18kgF and 22KgF thrust is what we measure at full throttle for 350W and 500W motor wheel. Thrust will be about the same for 700C, 27.5, 24 and 20in due to different stator winding however the amount of torque varies for hub motors based on wheel size. Which electric bike is best for me? How do I choose the right product? Firstly you need to find the right bicycle type for your physical shape and kind of application (Mountain bike, hybrid, upright, step-thru, cruiser, recumbent, Tandem, Delta trike, recumbent trike, etc.). This should be concluded by you with the help of your health advisors. Looking at various electric power assist systems we can give you some guidelines. If you are new to the topic the best practice is letting us chose for you. Fill out this form if you are looking for a complete electric bike. Fill out this form if you are looking for a conversion kit. You need to provide details such as your weight, expected range, road condition and riding attitude. Knowing the bicycle frame and style we’d get one step closer to the application and choosing the motor system. The motor drives the crank independent from the pedals. 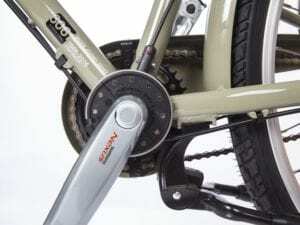 The power adds up with pedaling and transmitted to the rear cogs through the bike’s chain or belt. The motor is attached to the frame and the wheels are light. The best power system for a mountain bike, especially the full suspension bikers who do rock jumping, is mid-drive motor system. Bosch, Shimano STEP, Yamaha, Brose, are the most famous crank motor brands known today. You can only get these motor integrated with an electric bike’s frame and not as a retrofit. The price on these systems is high and they have some performance limitations due to increase reliability and enhanced safety. There are retrofit able versions of mid-drive motors which can be installed on existing bike bottom bracket. Don’t use such system unless you really want to do mountain biking or concern about the weight of wheel. Power through transmission always reduces reliability and durability of the e-bike, no matter what quality motor you purchase. Don’t hesitate to go for a hub motor system if you need a reliable commuter or pleasure ebike for city or trails. The motor is in the center of wheel, whether front or rear. They are lighter, more reliable and durable and best option to go for urban rides. We have direct hub motors like BionX which is known as a high end Canadian brand for over 10 years. They are smooth, silent powerful and reliable. Geared hub motors are lighter, more compact and offer higher torque. The light weight and compactness gives the opportunity to mount the motor on front wheel. They are also quite durable and maintenance free. Read this article for more details. It is a small high speed motor with a rubber pinion which spins the tire by friction such as Add-e motor which went viral for a while. We don’t think this can be a solid electric bike solution due to the high noise, lack of freewheeling, wearing tire, low efficiency and range and low reliability. Where are your electric bikes and motor system made? This industry doesn’t have a single land. The frame and bicycles are made in different countries including China, Taiwan and Canada depending on the brand. 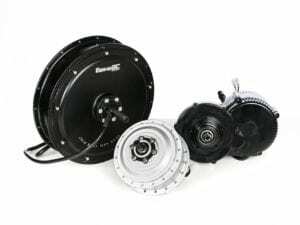 Our geared hub motor/controllers in our conversion kits are designed in Canada based on North American requirements and order to manufacture in various factories in China. Our company supervises the quality control over production lines to insure the safety, quality and performance of all components. The Li-Ion batteries uses Japanese or Korean battery cells and the packs are manufactured in Canada, Hong Kong or China depending on the model. How much should I spend with you to get a reliable commuter electric bike? We don’t endanger our reputation and risk the troubles of cheap and weak or un-safe products quality. The cheapest product our company offers still maintains the “Made in Canada” quality grade and is expected to be hassle free commuter within life span of the battery. It is proven for us you cannot expect a certain quality grade, service, warranty or performance if looking at a motor/battery system under 1100$ or an electric bike under 1800$. 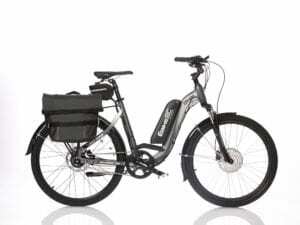 Geared hub motor electric bikes at the range of 2000$ to 3000$ can potentially meet both bicycle parts and electric system qualifications to be considered as a reliable commuter. If using a high brand mid-drive motor system such as Bosch, Shimano, etc. you need to make sure not to trade the bicycle quality with the motor brand in lower price bracket. I have seen cheaper and more expensive electric bikes from some hundreds to 10000$, what’s the difference? Something with good specs but too cheap should be checked for availability of spare parts or accessible support because unlike regular bikes it really matters for an ebike owner. Battery cells brand, depreciation or production date is a big deal. There is a calendar life on Li-Ion batteries; you don’t want to surprise yourself with a dead battery which costs 50% of the value after a year or so. Li-Ion battery packs can be quite cheaper and more dangerous if not being manufactured under certain standards, qualifications or inspection. There have been many catastrophic battery explosions in Canada and US in past year due to poor battery pack quality supplied under the name of famous brands like Panasonic. You might like to pay more on digital and display features, brand names, high end bicycle components especially for suspension mountain bikes; however the weight, durability, performance and the quality of motor/controller/battery will not vary much. Can I try the ebike before ordering? If you are located in BC Lower mainland or the areas where an EbikeBC dealer is in the reach, you can contact in advance and most welcome to come by and test ride various versions. I can’t reach your store or dealers, how do I purchase? EbikeBC is an online store and service center. You can select and order online your desired electric bike. You can inquire e-bikes to help you select the right e-bike. If you know the system and components which fit on your bicycle, you can select and configure your conversion kit and order online. You can inquire conversion kits to help you recommend the right kit configuration. If the part is listed in our online parts store, good to go; otherwise email us for the parts, repairs or service you require. I can’t reach your store or dealers, what happens in the event of a problem? Where can I buy spare or replacement parts? How much is the shipping cost to my address if I order online? Some products like conversion kits are offered free-shipping throughout US and Canada. A flat charge of 99C$ applies for Canada-wide delivery of electric bikes. Electric bikes to US may require up to 69C$ more; we will contact you in the event of such an increase in shipping cost. In general everything will be shipped from Vancouver local inventory. It takes 1 to 3 business days for orders to be processed, tested, packed and picked up by curriers. What TAX should I pay on my purchase? Canada buyers pay GST or HST based on the province they live in. BC buyers pay GST+PST on kits, parts and ebikes. Bikes with conversion takes 5% GST on all and 7%PST on conversion kit only. What warranty do you offer on your ebikes? Where can I find reviews published on your electric bikes? Find or post testimonials or customers’ reviews here. How can I compare electric bikes on your website? We try to make decision making process as simple as possible. You can start with style and look of the ebikes, then read through specs and options. Some products are customizable for some specs or features. In the end if you have special concerns, questions or comments before ordering you are welcome to contact us. Do you offer help, parts or repair service for electric bikes purchased elsewhere or from other brands? We will try to be a help. Technically we can replace, refurbish or repair Electric bike Li-Ion batteries of any brand. You need to share details such as Voltage, Capacity in Ah, shape and size of battery. For motor and controller issues you need to contact us and share details. Sometimes the labor wouldn’t be worth and we might recommend parts replacement. Do you offer event sales or off-season discounts? We are good at inventory management and always watch for production date of Li-Ion batteries in stock. We never keep products in stock for long and we typically don’t have aged or out of fashion goods to put on sale. On the other hand, we are keeping the sales margin as low as possible whole year round to keep up with the best value for money deal and lowest price guaranteed in North America. Contact us if you feel you need to get a better deal for a particular product. Are you a participating SCRAP-IT program for old car scrap incentives in BC? Yes, initiate your paperwork and join us to find the right electric bike.